Since moving in to our home around 18 months ago, the one room that’s been neglected is our bedroom. The living room is pretty much perfect, our dining room was next on the list and got an update last year, and our bathroom and kitchen never needed touching as they were almost brand new, but the bedroom just had the bed dumped in it and not much thought went in to styling the room. Now is that time though, and tomorrow we’ll be accepting a delivery from Ikea and taking on the ultimate couple’s test – flat packed furniture. Pray for us. From Ikea, we’ve chosen a new white wooden bed with hidden storage drawers to replace our black wrought iron sleigh bed (it’s as vile as it sounds, trust me) and a new mattress following a couple of flare ups with my bad back. We’ve also gone for a new sideboard/chest of drawers for storage, but there’s a few other pieces on my list that I’ll be picking up after our holiday. Colour scheme wise, we’ll (I’ll – Dan doesn’t get much of a say, let’s be honest) be going for a softer palette compared to other rooms in the house. Our living room has bright yellow accents, and our dining room is quite masculine with lots of monochrome, so this time round we’ve picked out soft whites and greys, with dusky pink accents. Think throws, artwork and trinkets galore! 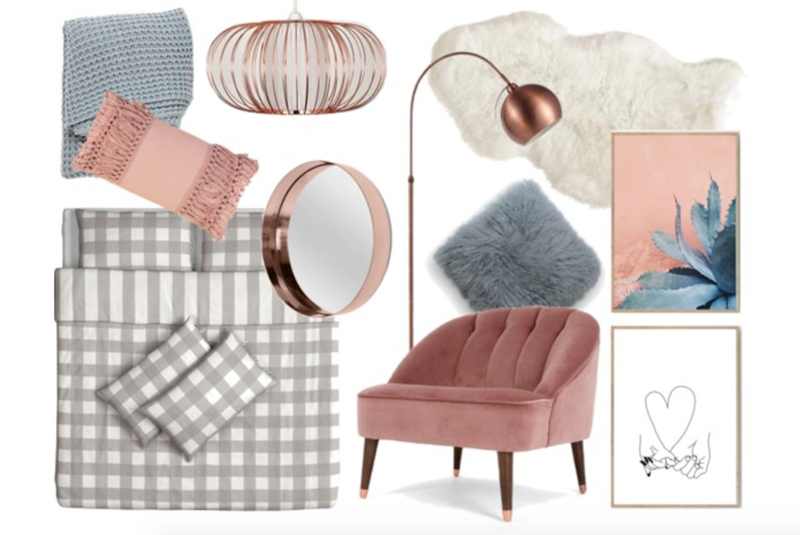 Here’s a load of pieces I’ve been lusting after to decorate the space, some of which I hope to pick up in the coming months to add to the theme. Next on my list is a cocktail chair for the dressing table! Where are your favourite places for picking up affordable yet stylish homeware pieces? I can’t wait for our room to be complete. Keep your eyes out in the next couple of months for a room tour post, as I’ll obviously be showing you the results!